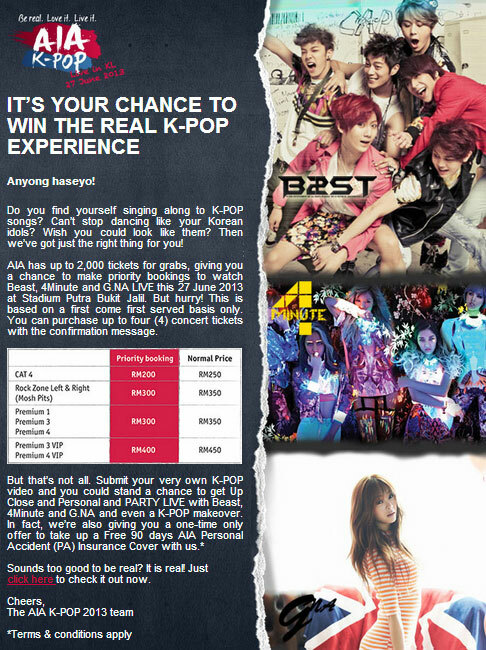 As you may know, the AIA K-POP Concert will be happening in Kuala Lumpur on 27th June 2013. With regards to ticket sales, there is a priority booking period starting 20th May 2013 to 25th May 2013. Tickets are priced at 10% – 20% cheaper during priority booking, so grab your tickets fast! All you have to do is to fill up the form in the above link and print out the confirmation ticket. Then, bring the confirmation ticket to any TicketCharge authorized outlets/TicketCharge office to purchase your tickets (up to 4 tickets per person) over a 5-day priority booking period beginning 20 May 2013. For people who might miss the priority booking period or are unable to head down to Malaysia to buy your tickets, official public sales will start on 26th May 2013 at TicketCharge’s official website. Also, you can visit the official AIA K-POP site at www.aiakpop.com.my or the official Facebook page for more details and updates on the latest concert news, photos and videos of your favourite K-POP artistes. You can also stand a chance to be one of the lucky winners to walk away with concert tickets and exclusive AIA-K-POP merchandize!